Whitney Vickers | Greene County News The 2018 Fair Royalty court includes (from top left to right) Prince Gunnar Gannon, Princess Frankie Travis, Queen Runner-up Grace Smith and (from bottom left to right) King Nicolas Shaw and Queen Janine Stover. XENIA — Poise, personality and participation — these were some of the traits the judges were seeking in the 2018 Greene County Fair Royalty. 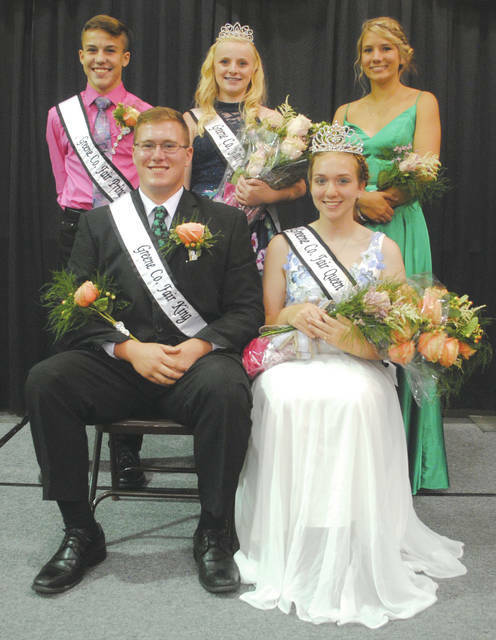 Janine Stover, 16, of Xenia, was crowned queen; Nicholas Shaw, 17, of Jamestown, was crowned king; Frankie Travis, 14, of Jamestown, was crowned princess and Gunnar Gannon, 13, of Cedarville was crowned prince. Grace Smith, 17 of Xenia was crowned the queen runner-up. Judges hailed from outside of Greene County and included Larissa Hileman of Adams County, Robin Hileman of Adams County and Holly Stickham of Madison County. They said they were seeking to crown individuals who participated in what they represent in 4H, FFA and/or Girl Scouts, as well as community involvement and strong leadership skills, in addition to having poise and the ability to speak on stage. While the competition took place, candidates were kept away from the stage until it was their turn to speak. King, queen, prince and princess candidates were asked two questions on stage but they weren’t aware of what they would be answering until they got onto the stage. King and queen candidates were asked what the main role of the fair queen and what role she plays in attendance, as well what TV character they would be if they could choose. Meanwhile, prince and princess candidates were asked what their greatest aspiration was and about their favorite part of the fair. Candidates started vying for the crown long before the competition took place as they were required to submit an application and essay and complete an in-person interview. Nine total candidates sought after the four crowns. Additional king candidates included Wade Hutchison, 16, of Xenia, who is also a former Greene County Fair prince. Additional queen candidates included Ashley Howard, 17, of Xenia; Molly Rubio, 16, of Jamestown; Emma Ryan, 17, of Spring Valley and Smith. Both the prince and princess titles were uncontested. Stover is a member of 4 Pawz and Claws 4H Club and the Greene County Career Center FFA. She said the main duty of the fair queen was to be a welcoming face and role model at the fair, while welcoming visiting royalty from other counties. Shaw is a member of the Buc-a-Roo 4H Club and said the main duty of the fair king is to be an example to the youth, adding that the young fair attendees will be what builds up the fair, 4H and FFA programs, and keeps it alive in the future. Travis is a member of the Jamestown Junior Farmers 4H Club and said her greatest aspiration is to open up her own business like her dad has taught her to do. When she was named princess at the 2018 Greene County Fair, it was her sister, Madison Travis — the 2017 Greene County Fair princess — who placed the crown atop her head and draped the sash across her shoulder. Gannon is a member of Creative Kids 4H Club and said his biggest dream is to join the MLB and play professional baseball. https://www.beavercreeknewscurrent.com/wp-content/uploads/sites/49/2018/08/web1_fairr1.jpgWhitney Vickers | Greene County News The 2018 Fair Royalty court includes (from top left to right) Prince Gunnar Gannon, Princess Frankie Travis, Queen Runner-up Grace Smith and (from bottom left to right) King Nicolas Shaw and Queen Janine Stover.